The Bernese Mountain Dog Parade began in 2011 because of a Bernese Mountain Dog named Clyde. Clyde was adopted from the Summit County Animal Shelter and Clyde had never really been socialized or walked on a leash. So Clyde’s new guardians in conjunction with the Town of Breckenridge began this annual parade as part of The Lighting of Breckenridge. Clyde was a rascal to say the least. Logistics: Meet between 3 PM and 3:30 PM in the courtyard of Main St Station - South Park and Main St. Dress warm. 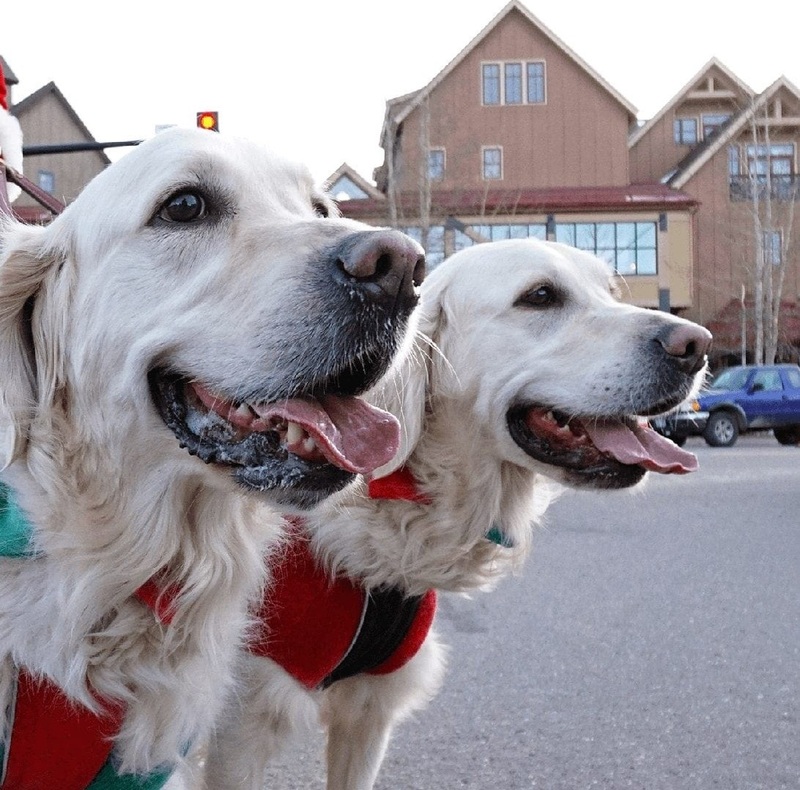 Procession starts at 3:45 PM Dog treats will be distributed compliments of Animal Lovers Pet Supply in Breckenridge. Dog must be present and only one treat bag per dog. That is how the dog count is done. Last year we had over 200 dogs. First come first served. Limited number available. Poop Bags will be given out. Have at least two bags in case your neighbor forgets one. Please always pick up after your dog. If you have questions, look for the Elves in the Red Santa Hat and wearing orange vests. I myself will have a large red Berner skirt on with a white fleece top. The Christmas Carolers will lead off the Procession. We ask that the dogs with carts lead off the parade in a single line. Everyone else then begins to walk North on Main Street in rows behind the dogs with carts. Please feel free to join in the singing. Security will be walking with everyone to make sure the path is clear and everyone remains safe. The entire group walks to Blue River Plaza in the Center of town. The dogs with carts will be directed to a special viewing area. All other dogs turn right on to Washington St and line up on the hill. Those people and dogs running in the Santa Race will continue on down to start the Santa Race. Look for elves to help direct you. The actual Lighting of the Tree is not until 5 PM. The most important part of this whole event is to have fun. When first imagined I did not realize the parade would become this popular. I just did it to help socialize my first Bernese Mountain Dog, Clyde, who I adopted from Summit County Animal Shelter. Clyde’s first family did not have time to socialize him, thus the parade. BTW Clyde was 8 years old when I brought him home and he lived until just before his 12th birthday. If you have not already when you get home sign your dog up for Berner Garde. All dog breeds are welcome to participate. Make sure your dog is on best behavior. Some dogs and people get stressed in large crowds. We all want this tradition to continue. Gail Marshall and everyone in Breckenridge.